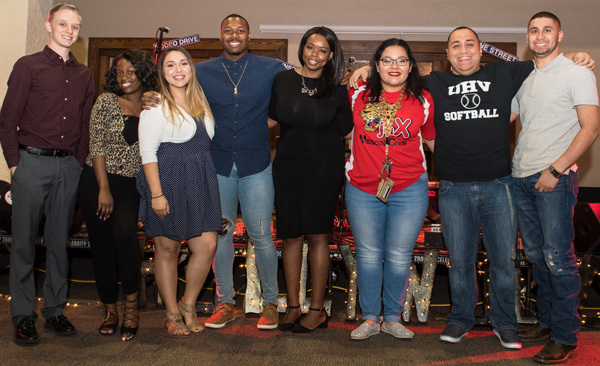 The 2018 University of Houston-Victoria Homecoming Court poses Monday at Jaguar Hall Commons. Pictured are Alec Thompson, left, Olajumoke Awe, Genesis Corona, Faizon Matthews, Lashanta Green, Jacklyn Medina, Victor Nenque and Jesse Gonzales. The Homecoming king and queen will be announced Saturday between games of a UHV baseball doubleheader against Huston-Tillotson at Riverside Stadium. The first game starts at noon. Also on Saturday, UHV will hold a 5K Jog for jaX, and the Riverside Food Truck Festival will take place. Other Homecoming events taking place this week through Saturday include an alumni banquet, talent show, powderpuff game and carnival. For a full list of events, visit www.uhv.edu/homecoming.